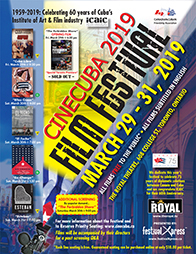 CineCuba is a 3-day film festival celebrating Cuba’s 60th year of independence, the birth of the Cuban Film Commission, and the special, more than 80-year relationship between Canada and Cuba. The festival will run from March 29 – 31, at the magnificently restored, historic Royal Cinema, 608 College Street in downtown Toronto. Thanks in part to our sponsors: festivalXpress, The Royal Cinema and Theatre, Canada Cuba Friendship Association, Carranza LLP, Urban Post Productions, ICAIC and Barry & Laurie Green. For more than 80 years, Canada and Cuba have enjoyed a very close relationship, Canada representing by far the largest number of tourists visiting the island annually. Yet many Canadians' perceptions of what is Cuba is linked to stereotypes related to the commercial tourist industry. CineCuba is committed to helping Canadians understand just why they are drawn to this idyllic and uncommonly friendly but industrious and ‎enigmatic paradise. So much do the Cuban people feel close to Canada, that every year, more than 5,000 cities and towns across Cuba participate in the Terry Fox Run. When the Fox family visited in 2010, they were recognized by almost everyone they met and were “completely overwhelmed” by the reception. The festival also celebrates the 60th anniversary of the founding of the Cuban Film Commission, the non-profit, non-political organization mandated with the promotion and development of the independent Cuban film industry. 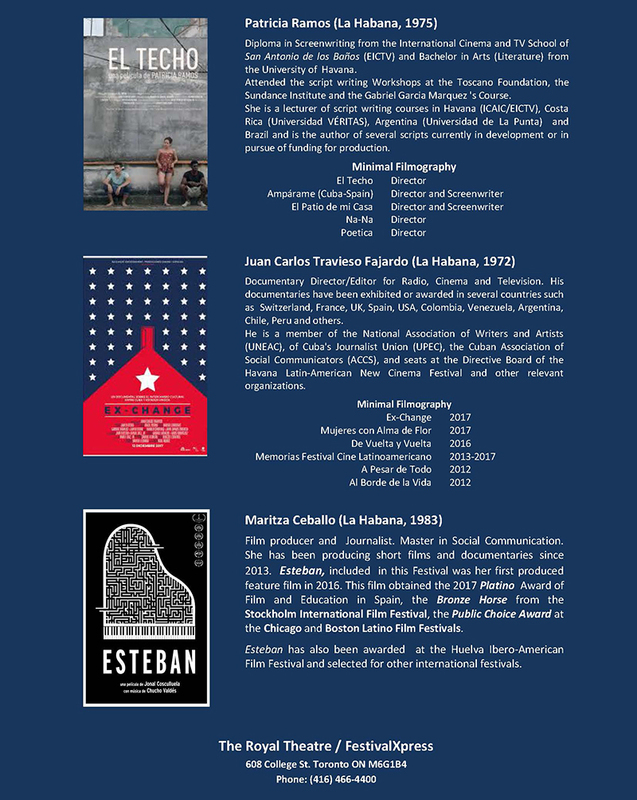 The commission creates opportunities for Cuban filmmakers to write, produce and direct their own projects; promotes collaboration with foreign production and Cuban filmmakers for film, television, and music video projects; and, acts as liaison between film providers in Cuba and government agencies. 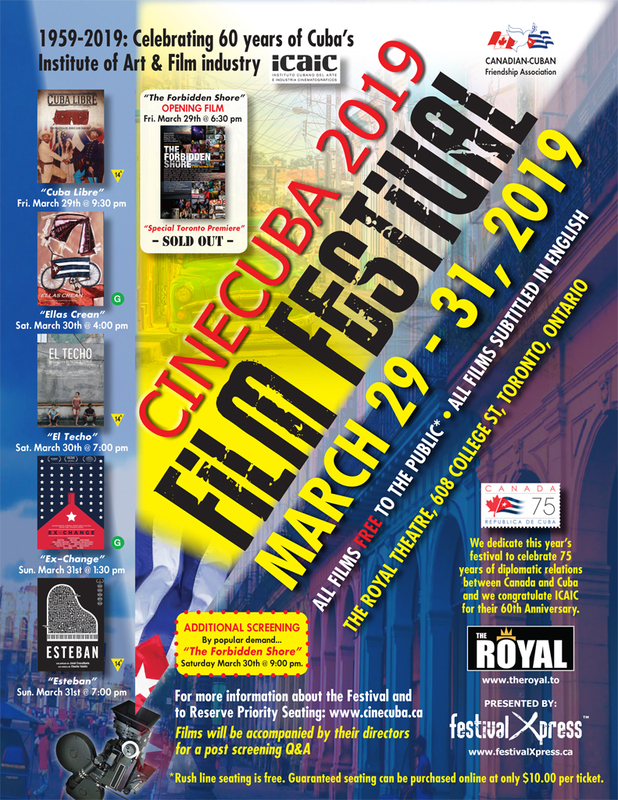 With full support from the Cuban Embassy in Ottawa, and the Cuban Consulates in Toronto and Montreal, CineCuba will soon announce the list of film directors and other senior members of the Cuban film community to appear at the festival. Complimentary Rush Line Seating* available for all films with the exception of the opening night screening of The Forbidden Shore which is SOLD OUT*. Rush line seating at all other screenings is on a first come first serve basis. The Royal holds 400 patrons; 200 seats for these films are available online at Universe.com at just $10.00 each‎, for those who would prefer to be assured of a seat! All ticket sales revenue will be donated to tornado relief funds for Cuba. We look forward to your corporate or personal participation in this important event.‎ A synopsis of all films follows below. 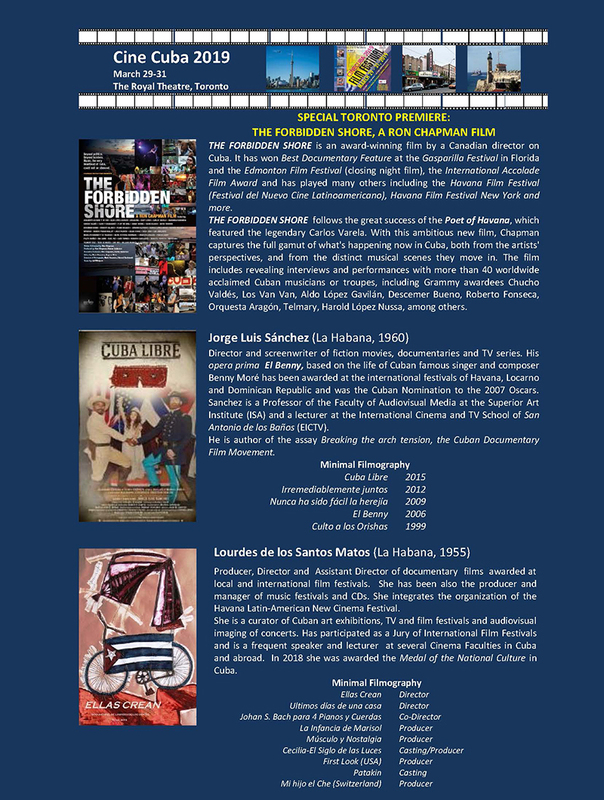 Join us at CineCuba 2019 and take in a pallette of perspectives on Cuba that promises not to shy away from showing real life in Cuba; one that amuses, entertains, and provokes an understanding as to how this often misunderstood nation manages to survive and to prioritize its medical and education systems to a standard that is world class by any measure. Cuban films have long been known to highlight controversial issues, yet they also unveil a populace that is generally happy, healthy, sharing, and enjoy an infectious sense of humour. Cuba has a rapidly evolving cultural and musical heritage and we are pleased to bring this to the Royal. CineCuba 2019 promises to delve into the sights, sounds and rhythms that make up the mosaic of history, art, music, sport, and daily routines that define Cuba. Synopsis: Politics silenced Cuban voices beyond its shores, but within, music is its very heartbeat. The extraordinary musical diversity of Cuba is revealed with over 40 performances by it's top artists, from street to concert, with shared stories revealing its people, culture, politics; their struggles and triumphs, vision, spirit and soul. Through unique footage, concerts & revealing interviews, filmmaker Ron Chapman shows the streets, people, musicians, music and stories of contemporary Cuba. Sinopsis: Los cubanos llevan años luchando contra España cuando en 1898 el gobierno de los Estados Unidos, tomando como pretexto la explosión del acorazado Maine, entra en la guerra colocándose del lado de los cubanos. Samuel y Simón son dos niños que viven intensamente el momento de la derrota de España hasta al traspaso del mando a los norteamericanos, que ignorando a los cubanos comienzan a comportarse como un ejército de ocupación. Synopsis: The Cubans have been fighting against Spain for years when, in 1898, the United States government, taking as an excuse the explosion of the battleship Maine, enters the war placing itself on the side of the Cubans. Samuel and Simon are two children who live intensely the moment of the defeat of Spain until the transfer of command to the Americans, who, ignoring the Cubans, begin to behave like an army of occupation. Sinopsis: Un recorrido por la Isla a través de mujeres que crean en sus espacios infinitos mundos de belleza. Participan: Liliet Rivera, Mayelin Guevara, Vionaika Martínez, Kenia Rodriguez, Liudmila Quincoses, Elsa Avilés, Yami Martínez, Yamira Diaz y Fátima Patterson. Synopsis: A tour of the Island through women who create infinite worlds of beauty in their spaces. Participants: Liliet Rivera, Mayelin Guevara, Vionaika Martinez, Kenya Rodriguez, Liudmila Quincoses, Elsa Aviles, Yami Martinez, Yamira Diaz and Fatima Patterson. Sinopsis: En el centro de La Habana, sobre una azotea, tres jóvenes amigos se reúnen día a día para contarse historias y sueños, a tratar de que el tiempo pase sin notarse. En medio de su aburrimiento, sin apenas recursos y soñando la prosperidad, deciden armar un negocio propio. El costo de este sueño, al fin, los conducirá a la madurez personal no exenta de cierta felicidad. Synopsis: In Havana, on a roof, three young friends gather every day to tell stories and dreams, to treat that time passes without notice. In the midst of his boredom, without money and dreaming prosperity, they decide to set up their own business. The cost of this dream, finally, will lead them to not exempt from certain happiness personal maturity. Sinopsis: Incluso en los momentos más difíciles la cultura ha sido un puente entre Cuba y Estados Unidos. Este documental aborda los conflictos, prejuicios, aciertos y errores en este proceso de intercambio cultural. El esfuerzo de muchos por acercar dos países a través de la cultura. Synopsis: Even in the most difficult moments, culture has been a bridge between Cuba and the United States. This documentary addresses conflicts, prejudices, successes and errors in this process of cultural exchange. The effort of many to bring two countries closer through culture. Sinopsis: Esteban es un niño de nueve años que descubre por casualidad su talento innato para la música. A pesar de las dificultades para alcanzar el sueño de convertirse en músico, su perseverancia transformará su mundo y el de quienes le rodean. Synopsis: Esteban is a nine-year-old boy who accidentally discovers his innate talent for music. In spite of the difficulties to reach the dream of becoming a musician, his perseverance will transform his world and that of those around him. festivalXpress is committed to producing and assisting in the promotion and marketing of community related and socially responsible film and entertainment events on behalf of fraternal, philanthropic and not-for-profit organizations and associations.